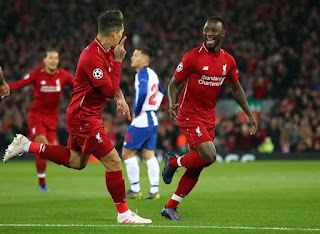 Naby Keita and Roberto Firmino were on hot form as Liverpool eased to a 2-0 win in the first leg of their Champions League quarter-final tie against Porto. The Portuguese champions had revenge on their mind after being dumped out by Jurgen Klopp's men in the last 16 of the last year's competition but a disappointing first-half performance has given them an almighty task in next week's return fixture at the Estadio do Dragao stadium. Keita's second goal in less than a week got the Reds up and running after just five minutes before Firmino fired a simple second in the 26th minute. Liverpool did most of the pressing in the second half of the game as Sadio Mane coming closest from long range but they were unable to find a third that would have all but ended the tie as a contest.